Find and compare the best prices from a range of well known car rental companies at Ljubljana Airport. This is a free to use facility, enabeling you to book direct with the company quoting the price. The terminal building at Ljubljana airport has been undergoing refurbishment which commenced in 2017 and is expected to be completed in 2020. A bus service runs from the airport to Ljubljana costing just over 4 Euros every hour during the day on week days (less frequently at week-ends), where there is a railway station. Brnik Ljubljana airport has 9 bars/restaurants, 4 shops, a bank, money exchange office, post office, conference facilities, VIP and business lounges, and WiFi Internet access. 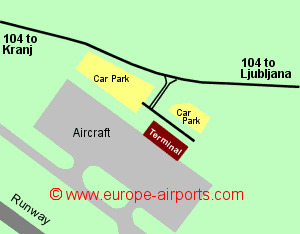 Ljubljana airport has Airport Carbon Accreditation, at the mapping level. 1.6 million passengers used Brnik Ljubljana airport in 2017, an increase of 19% compared to the previous year.